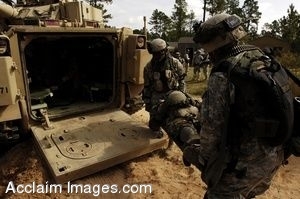 Description: Clip Art Photo of U.S. Army Soldiers from the 2nd Battalion, 7th Infantry Regiment, 3rd Infantry Division load a simulated casualty into an M113 armored personnel carrier during a mission readiness exercise at Fort Stewart, Ga., Sept. 25, 2006. (U.S. Army photo by Staff Sgt. Alfred Johnson). Stock photography by Department of Defense Public Domain.